The future of the materials ecosystem has been shifting towards the development of light weight and advanced materials which are more feasible for the applications in the wide range of industry verticals. Material testing and analysis has been carried out in all the manufacturing and processing industries ranging from the electronic components industries to the aerospace and defense and automotive industries. The prerequisite of advanced materials to meet the regulations with regards to the diverse industry verticals has been fueling tests procedures on materials thereby augmenting the adoption of material testing equipment across the industries. Material analysis & testing equipment market is segregated on the basis of test type and the equipment used in the type of tests, end user and geography. On the basis of test type, the market is categorized into destructive testing equipment and non-destructive testing equipment. Under destructive testing equipment, universal testing machine, servo hydraulic testing machine, hardness testing machine and impact testing machine. Under non-destructive testing equipment, flaw detectors, thickness gauges, hardness & strength testers and other equipment which comprise of corrosion testers, moisture testers and some other testing equipment. Construction, oil & gas, aerospace & defense, automotive, electronics and semiconductors are among the major end users considered to analyze the material analysis and testing equipment market. Construction is the dominant end user of the market whereas electronics and semiconductors are projected to witness rapid growth in the material analysis and testing equipment market over the forecast timeline 2017-2023. 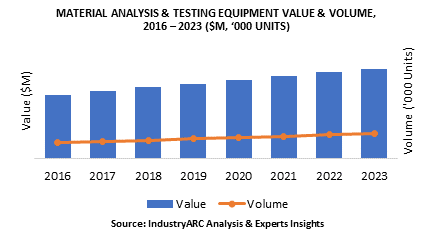 The overall market value of the material analysis & testing equipment is projected to reach $3.07 Billion by of 2023 with a CAGR of 4.82% during 2017-2023. In terms of regional distribution, Americas region is projected to account for more than 36% of the overall material analysis and testing equipment market and the share is expected to reach to 35% by the end of 2023. The APAC region however is expected to exhibit the highest growth during the forecast period. This is evident from the high sales of non-destructive testing equipment along with the mechanical testing equipment taking place in the emerging economies in the region.